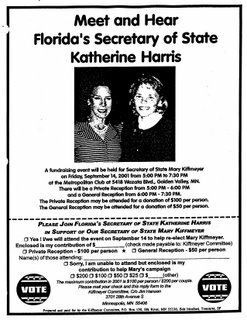 There has been a great deal of talk about how partisan May Kiffmeyer has been in her roll as Secretary of State, and just for a reminder of this I found this very interesting invitation for a fundraiser for Mary back in 2001. She invited her buddy Katherine Harris, the infamous Bush crony who handed him his controversial win in the 2000 election, which I have to point out sent us down the destructive road we are currently in with the bungled war and corrupt congress and administration. Some could argue if it were not for these highly partisan Secretary of States our county would be much much better off now. We need to send a message to the country that we do not want these types of overly partisan people in charge of our state elections. It is time for a change and time to send Mary packing. Mark Ritchie will bring respect and integrity back to the Secretary of State's office, and take it away from people like Katherine Harris and Mary Kiffmeyer.